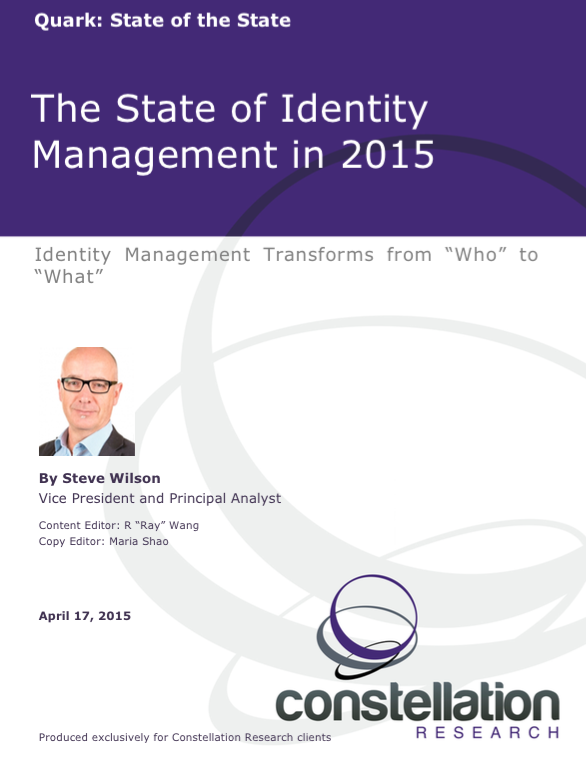 The State of Identity Management in 2015 | Constellation Research Inc. Since the dawn of the Internet Age, identity management has been top of mind, yet the focus has been on who people are online, instead of the more focused question of what they are. A preoccupation with personal identity reflects the clumsy “analog to digital conversion” – we are still working through the things that make the digital world different from real life. Many of the intuitions we carried over into the new world are breaking down and need to be remade. Constellation’s research team delivers its inaugural series on the state of the state. The state of the state explores the impact of digital transformation from a systems perspective. It takes into account political, economic, societal, technological, environmental, and legislative points of view. This research report explores a key area – Identity Management (IdM) – and how it is evolving rapidly to meet the needs of Digital Safety and Privacy.